Last year, I wrote about turning weakness into strength. A friend of mine shared with me another great example of this idea. Mike Birbiglia is a horrible sleeper. In fact, he calls himself the "worst sleeper in America". Rather than let this unique condition hold him down, he's decided to face it head on. In a partnership with Downy, Mike has agreed to spend a week living in a Macy's store window to test the freshness of their sheets. This concept is a win for everyone. Mike, who is a comedian, will surely get a boost in his career. 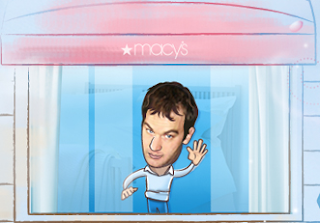 Macy's will get increased foot traffic in the store, as well as national publicity. And Downy, spreading its message of lasting freshness, will achieve increased awareness, which will likely convert to new consumer trial. This is a great campaign in which parent company P&G shows that despite having a large budget to advertise in more traditional ways, it can also utilize creative, inexpensive campaigns that have a viral effect on the Internet. Be sure to watch Mike to see if he sheets stay fresh!